With Winter upon us and Christmas fast approaching, we've found some of the best products to see you through the months ahead (and which would make the perfect present for your pet!). 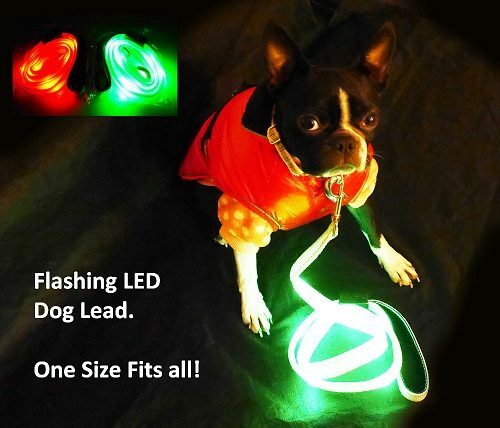 snugglezzz brings you an essential dog walking tool for those darker nights, with ‘flashing’ and ‘constantly on’ modes. Includes a rechargeable controller (charges via supplied USB lead or fixed solar panel) – so no more batteries to buy! One size fits all so makes a great gift. Why not take advantage of an exclusive 20% discount – add the code ‘snugglezzzk9’ at the checkout. Give your dog a duvet day with these luxury designer beds made for dogs in linen, cotton or denim with a thick luxury duvet insert designed for your dog’s comfort. A duvet which is neither a dog pillow, mattress or cushion and an alternative to a blanket, these plain and simple, beautifully made duvets are available in 11 colours. Available in sizes Small, Medium and Large. This exquisite, handcrafted embossed pink collar makes an ideal accessory. Made from 100% wool with brass fittings, it’s not only strong but also water resistant and machine washable. Absolutely gorgeous and available in sizes Small, Medium, Large and X-Large. With two separate treat-dispensing chambers and a squeaker, the Troog™ will keep your four legged friend engaged in positive playtime for a long time. Each of the treat dispensing chambers features a Treat Meter™ which adjusts easily to control the rate of release of treats depending on your dog’s level of play. Available in sizes Small, Medium and Large for bigger breeds. See more of K9 Magazine's reviews and recommendations next month!